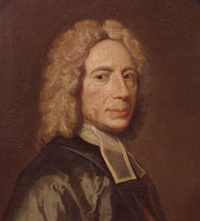 One of the greatest hymn writers of all time composed the beautiful hymn, “When I Survey the Wondrous Cross.” Isaac Watts (1674-1748) was born in England, the first son of a family of the Dissenting tradition. Though his training in Greek, Latin and Hebrew would have allowed him the opportunity to become an Anglican priest, he chose to pastor a Dissenting congregation. At the time of Watts’ birth, churches in England sang only metrical psalms. But by the time of his death, he had planted the seeds of a much more complex hymnody. His 600 hymns found in seven collections made the transition from a rigid, metrical psalmody to a freer, theologically-based hymnody. Watts’ hymns include complex theology in a format that is ideal for congregational singing. Hymns should echo the theme of the sermon. He insisted that songs in the church should be fully evangelical and not just supplements to the Psalms; that hymns should be freely composed and not just hold to the letter of Scripture; and that hymns should give straightforward expression to the thoughts and feelings of the singers and not merely recall events of the distant past. He also wrote texts to fit the most common psalm meters, allowing them to be sung by any congregation to a variety of tunes in such a way that each line contained a complete thought. This was important since the hymns, like the metrical psalms before them, were lined out by a precentor, or song leader. The leader would sing a phrase and then the congregation would echo back what had been sung. If a thought were spread out over two phrases, it would be broken up by this teaching technique. Watts smoothed out the process by including a complete thought in a single phrase as much as possible. Another example of the impact of his theology upon his hymns is that he edited texts based on the Old Testament to reflect the presence of Christ, causing his hymnody to view God the Father from the perspective of God the Son. “When I Survey the Wondrous Cross” is one of Watts’ finest poems and an excellent example of why he is considered a fulcrum in the transition to hymnody. The Rev. Carlton Young, editor of the 1989 UM Hymnal, notes that this hymn is clearly something different than Watts’ earlier poems that might be characterized as devotional poetry or as psalm paraphrases. Several hymnologists have noted that this hymn, first published in Hymns and Spiritual Songs (1707), is an excellent example of many of his best techniques, such as his ability to write beginning lines which capture one’s attention, maintain a theme and build to a climax. In the UM Hymnal, the text is set to two different tunes. The first, HAMBURG by American Lowell Mason, was written in 1824. This tune originated from Gregorian chant (presumably the Benedictus) and was first published in the third edition of the Boston Handel and Haydn Society Collection of Church Music (1825). The second tune, ROCKINGHAM, composed by Englishman Edward Miller in 1790, was first matched with this text in Hymns Ancient and Modern (1861). “When I Survey” is a hymn which is saturated with theology and a call for an emotional response from the singer. This hymn was transformed into a statement of faith that crosses denominational lines and generations. According to hymn scholar Lionel Adey, the lines “‘All the vain things that charm me most / I sacrifice them . . .’ have a meaning personal to each singer, one that might require either action or renunciation.” The three pledges at the climax of the hymn (“my soul, my life, my all”) are a sacrifice that had once been required only of those taking monastic vows. Ms. Tillay is a candidate for the master of sacred music degree, Perkins School of Theology, and studies hymnology with Dr. Michael Hawn.